This view shows the start of the 2012 transit of Venus across the sun (upper left) as it begins to cross the solar disk on June 5, 2012. The transit of Venus has just begun, and already the first photos are coming in from skywatchers and scientists worldwide. The planet Venus is making a rare pass in front of the sun today (June 5), providing a view from Earth that won't come around again until 2117. 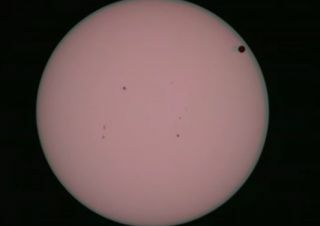 The transit is visible from at least four continents, and began at 6:09 p.m. EDT (2209 GMT). It is due to last six hours and 40 minutes. On June 5-6 2012, SDO is collecting images of one of the rarest predictable solar events: tthe transit of Venus across the face of the sun. This event happens in pairs eight years apart that are separated from each other by 105 or 121 years. The last transit was in 2004 and the next will not happen until 2117. This image was captured on June 5, 2012. The Solar Dynamics Observatory caught Venus at first contact with the Sun during the start of its transit. Amateur skywatchers have also fanned out across the globe to catch the transit. And, as expected, Twitter is abuzz with #VenusTransit posts, with some tweeting "sad faces" as their view of the small dot passing across the sun has been blocked by overcast. Others, meanwhile, are amazed. "Just saw my 'soul up there'...little black spot on the sun today," tweeted NASA Jet Propulsion Lab's science writer Whitney Clavin under her Twitter name @whitnutt. "Just got to see Venus through a solar telescope just before a cloud rolled in #venustransit - amazing!!! !," tweeted National Science Foundation planetary astronomer Meg Schwamb. Stay tuned with SPACE.com for more Venus transit photos as they come in!